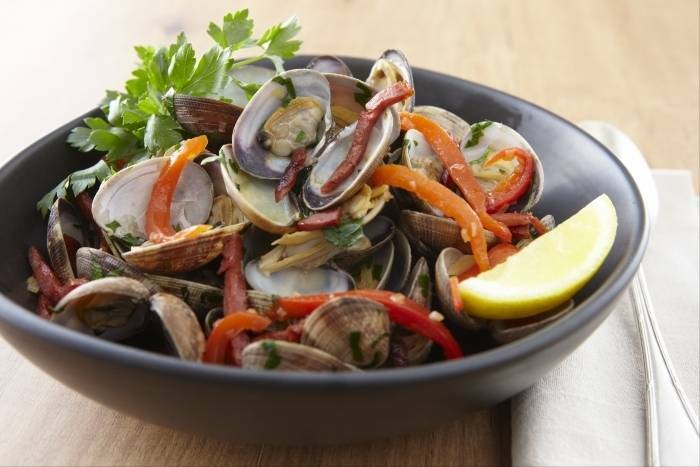 A refreshing broth of clams, chorizo, sweet peppers, parsley and lemon. Wash the clams well under running cold water. Slice the chorizo into thick rounds. Peel and finely dice the shallots and garlic. Pick the thyme and add the stalks to the stock. Sweat the shallots and garlic in a splash of olive oil until soft. Add the thyme leaves and sliced red peppers and cook for a further minute. De-glaze with the sherry. Reduce by half and then add the stock. Season with salt and pepper. In a cold pan cook the chorizo until crispy and the paprika flavoured oil has rendered from the chorizo. Pick the parsley and roughly chop half of it. Retain the remaining leaves in cold water. Add the clams to the broth and cook until they open, finish with lemon juice and chopped parsley. Spoon the broth into a bowl and finish with the crispy chorizo and picked parsley.